Cognitive, social, emotional, and physical development of the whole child for grades K - 5. The Lower School Program at Park City Day School inspires students to become dynamic citizens and future leaders by integrating academic achievement, creativity, positive group interaction, and social responsibility. Within the program, our students’ individual learning styles are recognized and supported, their academic strengths are nurtured and developed, and areas for development are identified and advanced. Lower School students engage in authentic learning, decision-making, and problem-solving activities that help develop higher level thinking skills. The curriculum is designed to instill high ethical standards based on cooperation, appreciation, and respect. By working collaboratively, diligently, and honestly within our community, students grow and achieve while developing the lifelong skills they need to live healthy, fulfilling lives. A typical day in the classroom includes a variety of imaginative, hands-on learning activities that foster a love for learning while mastering the fundamentals of core subjects. Daily morning meetings in homerooms set the tone for a productive, engaged day of studies. Students engage in Math and Language Arts lessons daily and travel from homeroom classrooms to specialists classrooms for one to two periods a day. Lunch in classrooms or together in the multipurpose room is followed by daily recess outside at one of our two play areas with access to swings, play structures, tricycles, jump ropes, a variety of ball and team games and - in our beautiful Park City winters - sledding! Cross-grade level learning and social opportunities, inquiry-based STEM science, a state-of-the-art Visual Arts Studio, experiential learning through educational field trips, and authentic service learning projects enhance the curriculum and enrich the lives of our students. The positive, nurturing environment found in each classroom is a result of our low student-to-teacher ratio and high expectations for our daily interactions with one another. Within each grade level a rich array of art, music, physical education, foreign language and technology tools complement and extend core offerings. This integrated education broadens learning and deepens each student’s appreciation for the world in which we live. 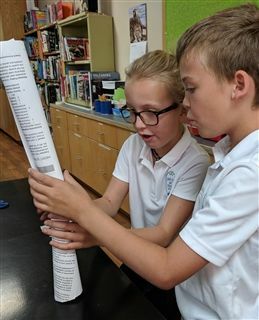 Students in Joanne Staral's Lower School science classes learn as much from the world around them as they do from the textbooks in the classroom. With a focus on hands-on learning, students explore and manipulate their world through scientific inquiry and design theory, with an emphasis on STEAM content. Meet Joanne and the rest of our faculty.